Roland's GO:PIANO borrow from the Japanese giant's highly acclaimed home instruments. As with an acoustic piano, each note is nuanced and filled with character, guaranteeing a unique tonal palette to paint with. The richness of the sound reproduction will keep you coming back for more, encouraging and inspiring you to practise and hone your skills. As you develop and improve, you can explore electric pianos, organs, and many other sounds that will expand your musical creativity and understanding. Developing a correct playing technique is a must from the very beginning, and the GO:PIANO is equipped with 61 standard keys that provide authentic feel and response. The size and shape of the keys match those of an acoustic grand piano, so making the transition from the GO:PIANO to a standard acoustic piano will be as seamless as possible. The Roland GO:PIANO Digital Piano is the ideal instrument to accompany you on the move. The lightweight design and compact form factor make it perfect for dropping into a gig bag and hitting the road. With a choice of AC adapter or power from six AA batteries, you can hit the great outdoors, entertain friends, become the life and soul of the party, or simply pop in your headphones and lay down some tracks. The GO:PIANO features a range of tools for improving your playing skills daily. The metronome features enable you to tighten up your timing, whilst the transpose function allows you to change the musical pitch of the keyboard. The onboard recorder allows you to track your progress, as well as enabling you to share your music with the world. 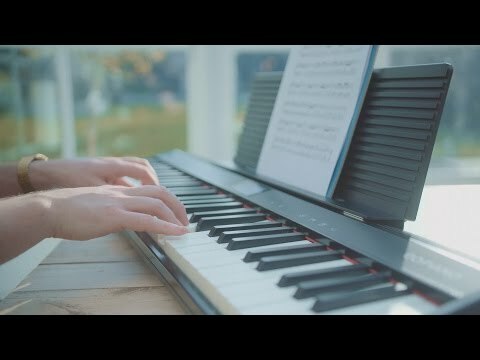 To give your musical education a helping hand, every GO:PIANO comes with a three-month subscription to Skoove, a fun and immersive music education platform that offers online piano courses. Getting started couldn't be easier, and couldn't be more enjoyable. Thanks to the handy online tutor, you will learn to read music scores and understand theory in digestible steps, whilst playing along to your favourite chart hits or classical pieces. What are you waiting for? !